Hello my friends. I just have to show you all my newest creation or brainy idea. As the next 4 pictures of before and after show, I had this green faux boxwood wreath. You know.....The need for something springier (if that's even a word!) as this winter has overstayed its welcome here. Anywhooooo...... I put this darn wreath up and from then on I was on this mission.......(spy music please) and one thing led to another. After hanging the wreath I felt that it stuck out like a sore thumb. To much green for my taste. Sooooo, here we go. 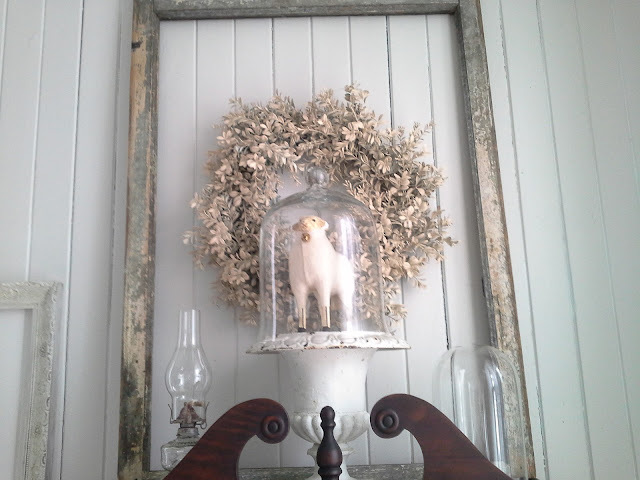 I had a vision that this wreath surely would look great if it somehow matched the colors in the old window frame. Great idea ha? Well, it was a great idea...no, really it was. After several attempts with white spray paint it stuck out again like a sore thumb. It was way to bright. and with shades of green.....NO not shades of grey. So another redo, and do, and do.....Ugh! My last hope was to try another color in an off white spray paint. Yey!!!! It turned out just the way I imagined it would (o.k., little white lie). But anyways, I love it! It has all the colors that the frame has. And I have no more sore thumb issues... What do you think? Thumbs up? 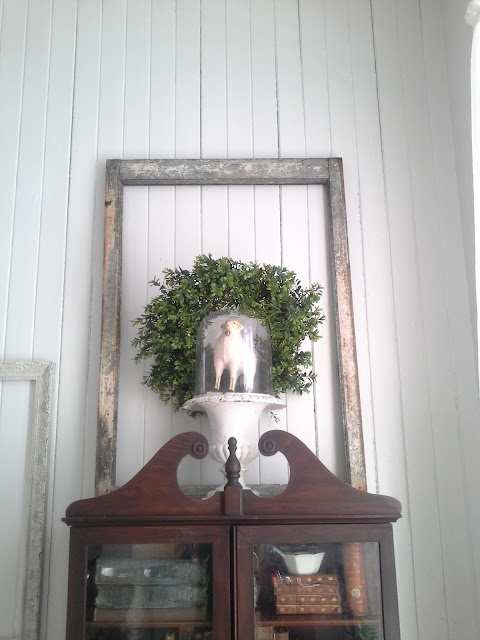 Had this pretty green faux boxwood wreath to hang up in center of old chippy window frame. But I thought it stood out to much and needed to be softened up a bit. Here is the wreath in a new look! Love it! Love it!!!! I also liked it in its original form. I'm coming from the GYBP and am following you. I'm also living in an old house with old outbuildings. I'm going to begin work this spring renovating my 1930s cordwood barn. Please stop over and check it out. I'll be back to read about your projects. This turned out beautifully! I love your decorating ideas. Love it too! What an idea! I like that glass dome and with the wreath was it hard to get under the leafs? Hi Laura, with spray paint it makes it pretty easy to get under the leaves. Since I did not want one solid color, I would jusy turn it upside down and even sideways until I had achieved the shade I wanted. Hope this helps. 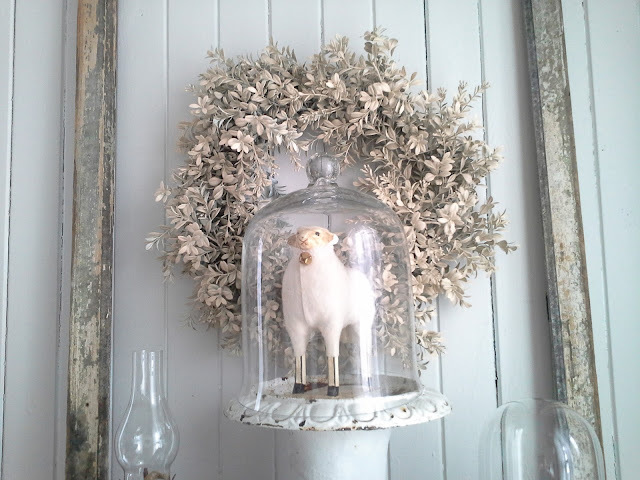 What a sweet little lamb under glass. So pretty. Love it, it turned out great!! Well,I liked both versions of your wreath, but I know what you mean when you have a different vision in your head. You have to try anything and everything to get to that same vision in person!! 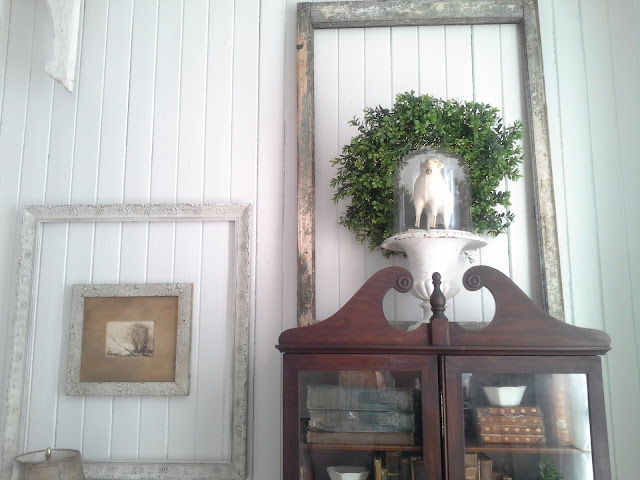 Love your decorating ideas. I love what you did with your wreath. It's wonderful. Stopping by from the grow your blog hop. New follower! I've been in that situation myself... and I always try to remember "it's just paint" so try again. And ta-da! I finally get the look I was after! Such a lovely vignette! The lamb under the cloche is perfect to add into the mix!